Team creation and group cohesion processes typically consist of a balancing act between skills, availability, gut feeling, past successes and experience. This makes it difficult to identify the characteristics of high performing teams on a consistent basis and to then replicate these across a business. By extension, it's hard to accurately predict how a team will perform as a result of an informal team creation process. By combining skills, experience and the data from 4G, 4G makes it possible to optimise team creation and group cohesion processes. As a result, engagement, efficiency and performance are all systematically improved. It's very easy to incorporate 4G into team creation processes and it doesn't matter if the existing approach is currently formal or informal. Having completed the 4G assessment, team members are selected based on 4G relationship compatibility, plus skills, availability and experience as required. Diagram 1 shows 3 teams each with 4 people. 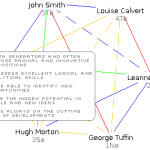 The breakdown of Social Relationships is random in this example and as a result, there is a reasonably even spread of green, blue, yellow and red relationships. This is typical of the majority of teams encountered in organisations, not least due to the often ad-hoc nature of team creation processes. By using 4G as one of the inputs into team creation, it is possible to optimise and enhance the relationships in the team, along with improving performance and engagement. 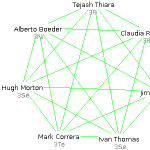 Diagram 2 shows the same 12 people but their team membership has incorporated elements from 4G. The corresponding improvement in relationships and group cohesion is clearly visible. The ROI from the team creation and group cohesion processes above can be shown within a few months via existing internal measures of performance. The ROI can also be scaled to cover large numbers of teams and potentially the whole organisation.